Army has revised TGC 118 SSB interview dates. 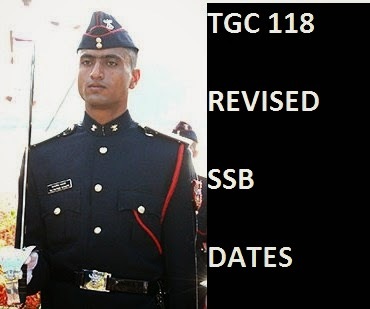 Check out complete list of changed SSB dates of TGC 118 course of Army here. Indian Army has released notification of TGC 118 course on . Male candidates who have completed their engineering were asked to apply for the technical officer post. Thousands of applications received by Army Headquarters and after scrutinizing applications thoroughly, Army officials published a list of candidates whose engineering marks were not submitted and asked the applicants to submit the marks accordingly. Recently SSB dates of TGC 118 course were released by Army. But today Army has published fresh list of SSB interview dates for all candidates who have applied for TGC 118 course. Revised SSB dates of TGC 118 course. Candidates are advised to check the list and find the changes, if any.